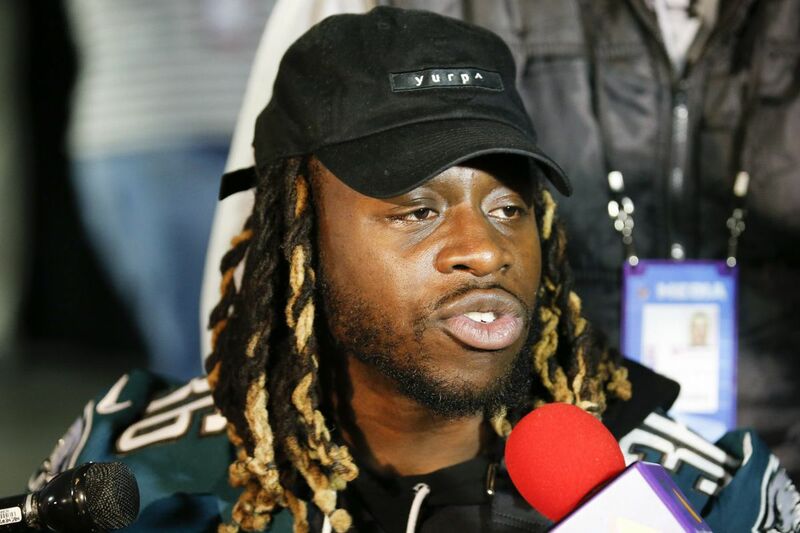 Eagles running back Jay Ajayi answers questions during the Eagles media availability on Wednesday, January 31, 2018 at the Mall of America in Bloomington, Minn.
BLOOMINGTON, Minn. – Jay Ajayi arrived in Philadelphia on Halloween night with swirling emotions. Miami had unceremoniously traded Ajayi after a Pro Bowl season, he was joining a 7-1 team that would not feature him as the unquestioned lead running back, and there was curiosity about how such a notable trade would affect the team dynamics. Ajayi's addition didn't disrupt the locker room. It didn't hurt the offense. It made the Eagles better. He gave the Eagles the explosive running back they needed, and Ajayi will likely be a key part of the game plan in the Super Bowl against the New England Patriots. If you're looking for a potential MVP candidate if the Eagles were to upset the New England, pay attention to Ajayi. He's listed as 15:1 to win the award, the second-lowest odds among Eagles after Nick Foles. An Eagles win would likely require Ajayi being a difference-maker against a Patriots defense that allowed 4.7 yards per carry, although their run defense has played well in the postseason. "I believe I'm a true competitor," Ajayi said, "so I always believe I'm ready to make big plays to help this team." Ajayi started the two playoff games for the Eagles after starting just once in seven regular-season games, showing his growing role. He rushed 18 times for 73 yards in the NFC championship game victory over Minnesota, which marked his most carries since coming to the Eagles. That followed 15 carries in the divisional round, which had been his previous Eagles high. Ajayi also had three catches in each of those games. That's as favorable of a scenario as the Eagles could have expected when they acquired Ajayi in Week 9. Even Ajayi didn't know what to expect. "There were a lot of emotions," Ajayi said. "It was really, what is Philadelphia like, what is the building like, what are the coaches like, what are the players like? I didn't know anything about Philadelphia. I had a great meeting with Coach [Doug Pederson], that helped me a lot. Great meeting with Duce [Staley, the running backs coach]. And I had a great feeling. I could feel it. I could sense that I was in a great situation." It was a good sign when Ajayi rushed for 77 yards on a short week in his first game with the team. That included a 46-yard touchdown when he first displayed his "Jay Train" alter ego in an Eagles uniform, revealing his engine-cranking celebration. Ajayi averaged 5.8 yards per carry in seven regular-season games as part of a running-back committee. The committee hasn't changed in the playoffs, but it's clear Ajayi is atop the depth chart – especially between the 20-yard lines. "Obviously in a committee, it is a little tougher because it is the hot hand and every opportunity you need to take full advantage of it," Ajayi said. "You never know how it's going to go. You have to make sure every time you step on the field you make it count." Ajayi said the running backs are supportive of each other, noting how they're the first ones to celebrate with each other when they score. He didn't know many players when he joined the team, but he said the running backs quickly welcomed him. "There was a feel-out period when I first got here, obviously, first trying to learn the playbook, first trying to learn my life and everything," Ajayi said. "But it was very embracing, from the running-back room to the whole locker room." In a short time, Ajayi has also taken to the Philadelphia fans. A London native who cheers on Arsenal, Ajayi thinks Eagles fans compare most to Premier League supporters. It didn't long before he became recognized around the city – and a big Super Bowl performance will amplify that profile. Ajayi is confident the Eagles can run against any defense. He said the Patriots are disciplined in the defensive gaps, so it'll be up to the offensive line getting the push they need and the running backs breaking tackles. The Eagles will likely make it a priority to establish a run, and they view the running game as a way to help Foles find an early rhythm. Ajayi's success this year came without offseason workouts and a training camp with the Eagles. He's spoken with Staley, the former Eagles' running back, about what could happen next year when he has a full offseason with the team. Ajayi could be the unquestioned No. 1 running back and take on a larger role. But there will be months ahead to worry about that. He has one more Sunday, and he needs a big game. His season has been a whirlwind, and he admitted, "It's like I don't even remember the Miami season anymore." He'll take time next week to review all that happened. He's hoping it's after a Super Bowl victory. If all goes right, it could even be as the Super Bowl MVP. "Here I am today," Ajayi said, "being the Jay Train in the Super Bowl."